A stunning and glamorous pair of Bzero1 Pave Diamond earrings from Bulgari. 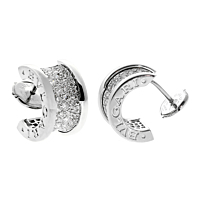 These earrings are set with gorgeous Bulgari round brilliant cut diamonds in 18k white gold. Featuring the iconic BVLGARI inscription on either side, these earrings are sure to make a statement. Beautiful and bold, these make a wonderful addition to any collection. Bulgari's brand of luxury goods began when it was founded in Rome by Sotirios Voulgaris, a silversmith from Greece who had moved to Italy for a better future. His talent and passion working with valuable metals and stones eventually allowed him to open his own jewelry shop in 1884. Bulgari's early work was noted for silver pieces that were inspired by ancient Greek and Roman art. In the years to come, more and more Bulgari stores were opened across Italy. After Sotirios died in 1975, his sons carried on his legacy, and gave Bulgari the image it has now. They first used the BVLGARI logo in 1934 in their flagship store. As an international brand, Bulgari is a major player in the luxury goods market. The predominant use of yellow gold for the company’s jewels is known as a Bvlgari trademark globally. In the years since, Bulgari has diversified with the introduction of B.zero1, Divas' Dream, Serpenti, BVLGARI BVLGARI and Parentesi. The Bulgari watch collections include Octo, BVLGARI BVLGARI, Diagono and Haute Horlogerie for men and B.zero1, and LVCEA, Serpenti, Divas' Dream, BVLGARI BVLGARI and High Jewellery for women. In 2009, Bulgari took became involved in a partnership with Save the Children, with a campaign that included the launch of a Save the Children custom jewellery collection, of which a portion of the proceeds went to the charity. Bulgari's contribution as of 2018 is approximately 80 million dollars.